Generalizing from one group of chimps to the whole species is a sticky business. |SOURCE| Human cultures have widely varying norms when it comes to friendliness and politeness. Make accidental eye contact with a Londoner on public transport and suffer mutual horror, but go to South Africa and find yourself routinely embraced by complete strangers. For researchers studying human behavior, there’s a strong push to study a wider variety of different populations around the world in an effort to expand focus beyond rich westerners. But when it comes to animal behavior, differences between populations have come under less scrutiny. A paper in PNAS this week explored differences in social behavior between four different populations of chimpanzees, finding that the groups had very different norms when it came to hanging out together and grooming one another. They point out that this means studying one population of chimps might not always be enough for accurate claims about the species as a whole. The Chimfunshi Wildlife Orphanage Trust in Zambia is an ideal place to investigate differences between chimpanzee groups. It's home to 120 chimpanzees, some of whom were wild-born but needed to be rescued and some of whom were born in the orphanage. The sanctuary has distinct populations separated from each other but all living in the same ecological environment. That’s important, because when it comes to studying population differences between chimps, the environment could play an important role. If two groups of chimps have different methods for cracking nuts, is that the result of them passing down different traditions to their children or just a result of the nuts and tools available in their kind of forest? While some cultural traditions—like nut-cracking—have been established in chimps, primatologist Edwin J. C. van Leeuwen and his colleagues wanted to see if there were broader cultural differences in social behavior. So they tracked 89 different chimp individuals across four populations, gathering data over a period of two years. Because all the chimps were living at Chimfunshi, differences in the habitat wouldn't play a role in any cultural differences they found. There could be other explanations, too, of course. One of the big ones is demographics, and they found that this did explain some of the differences they found: in the bigger populations, individuals had a lower likelihood of getting to know each other and groom each other—much like people knowing more of their neighbors in a small town than in a big city. But they also found differences that couldn’t be explained by population size. “Some populations proved more gregarious than others,” write van Leeuwen and his colleagues, both “in terms of the size of their typical congregations throughout the day and their proclivities to associate and positively interact with others.” In the friendlier chimp cultures, social network analyses showed higher levels of social cohesion between individuals. 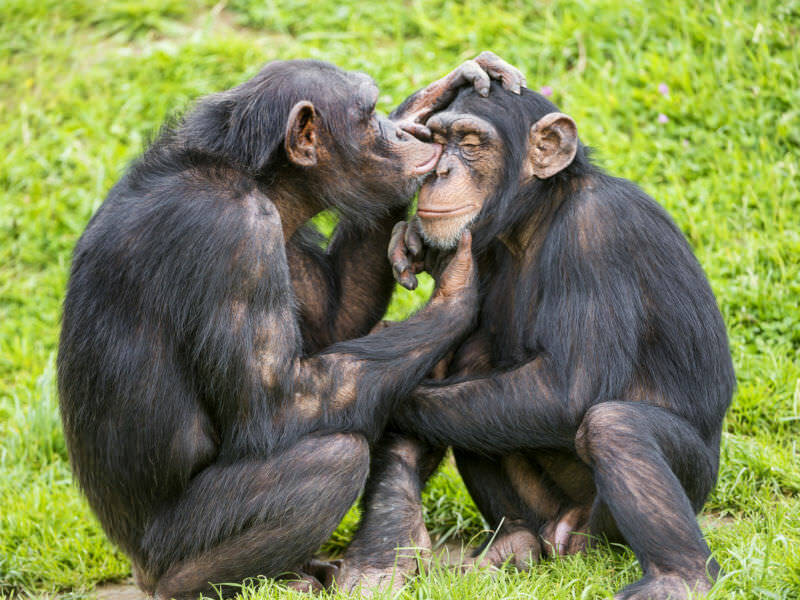 There could be factors beyond group tendencies, too—individual chimps have different personalities, and the group differences could fall out as a result of which chimps happened to be in each group. This could be a major issue, given the small numbers of chimps involved. The real key is seeing whether the differences persist over generations: if the behaviors change as the members of the group turn over, then it’s likely to be a matter of personality. But if they stay the same over time, that implies that baby chimps are learning the social norms as they grow up and then perpetuating them. Long-term studies exploring this would be hugely valuable, the researchers suggest. Another useful kind of experiment would be watching what happens when unrelated groups of chimps merge. This sometimes happens when, for instance, a group is moved from one zoo to another, and it’s a useful way to see which bits of chimp behavior are learned and which are instinctive. But these results are enough to suggest that researchers studying one population of chimps might suffer the same limitations they'd face if they were studying just one population of humans, the authors argue. Experimental studies exploring social behavior in primates, which often have very small sample sizes, “may be biased in their particular study population,” they write. Researchers studying social behavior in our closest relatives are often trying to understand the evolutionary roots of human behavior, so it’s crucial to properly understand the variability of the species we’re studying if we're to properly understand ourselves.